Sujeev Shakya, founder of Nepal Economic Forum and Himalayan Consensus Executive Board has been a leader in organizing volunteers and youth organizations in the post earthquake relief effort in Nepal. Sujeev explains, "We have been trying to through our not-for-profit focus on just one village at Sindhupalchowk comprising of 560 households with 2500+ people and see how we can contribute to bringing their lives back to normal working with communities." On June 10, 2015 Sujeev convened the volunteers to share experiences in disaster response. Together they discussed the challenges in rebuilding Nepal. Many of the volunteer organizers noted how when international agencies came into the crisis, they themselves did not know how to address practical issues. 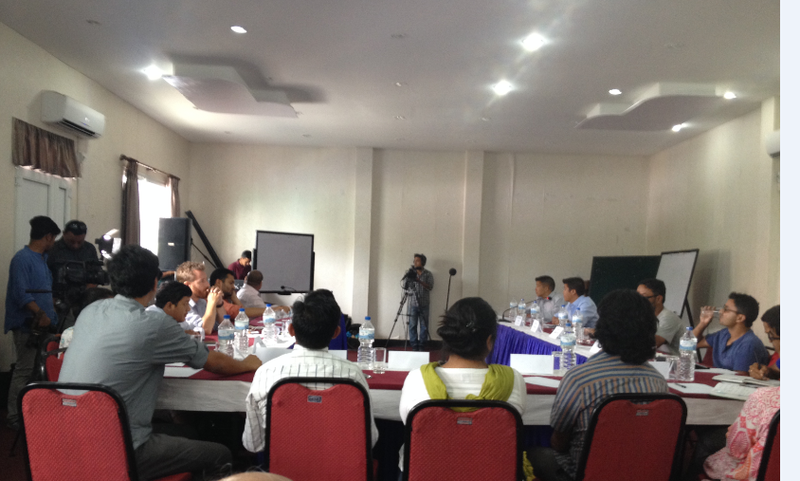 Many of the volunteers are themselves business leaders in Nepal. "We deal with crisis every day," explained one. "So when addressing this crisis, how to organize, what to do next, where to go and how to deal with local conditions, we knew much better than the international donors and teams that arrived in Nepal. In the end, they needed our help." Firmly on each organizer's mind was the significance of "Nepal rising" that is Nepali people taking the challenges into their own hands and responding with action while many international agencies were busy calling to "donate to us, donate to us" knowing the funds would never reach Nepal. Meanwhile with hardly any funds at all Nepalis responded to their own crisis and demonstrated to the world how far local knowledge can go in pragmatically dealing with crisis.